Social media continues to grow and emerge at a rapid pace, and quick serves are working hard to keep up with their various networks, including Facebook, Twitter, Google+, and YouTube. Now there’s a new player on the field: Pinterest. Unlike other social networks that have evolved over time, Pinterest has exploded in the last year, and its impact may be far-reaching. This has made the social media outlet a must-have option for quick-service operators. Essentially, Pinterest is a virtual, visual bulletin board where users can “pin” items of interest found online in one spot known as “boards.” These pinned items link back to the websites where they were collected, making them ideal referral tools. Unlike other social media networks, Pinterest relies on images rather than text. “It’s a new fun way to share photos with those of like interests,” says Linda Duke of Duke Marketing LLC in San Rafael, California. The invite-only network (operators can ask for one on the homepage at Pinterest.com) launched in 2010 and grew quickly, reaching 11.7 million U.S. unique monthly visitors in January 2012, according to comScore. Users now spend more time on Pinterest than any other network except Facebook and Tumblr, per comScore. Although initially popular with users sharing content related to DIY projects, recipes, weddings, and other visually strong subjects, Pinterest now has many brands building a strong following. Dunkin’ Donuts set up its Pinterest account at the beginning of February and already had more than 1,300 followers by month’s end. “We spent a lot of time on Pinterest and saw that Dunkin’ Donuts fans were leveraging the platform to share what’s important to them, from their favorite donut, their go-to Dunkin’ Donuts coffee beverage, unique Dunkin’ Donuts restaurants they’ve seen in their travels, and more,” says Jessica Gioglio, public relations and social media manager of Dunkin’ Brands Inc.
To make the most of a Pinterest account, experts say brands should interact with their followers, not only by showing the latest menu items but also by engaging followers through shared interests, providing insight into the people behind the brand, and trading ideas with followers. For instance, on Tender Greens’ Pinterest boards, followers can see what makes the company’s chefs tick, learn more about their local farming network, and see market reports on the latest produce, says Erik Oberholtzer, cofounder of the fast casual concept based in Los Angeles. To get the word out about the brand’s Pinterest account, quick-serve operators can promote their Pinterest boards through their other social media outlets. Contests on Pinterest are another great promotional tool, says Katy Lynch, president and cofounder of SocialKaty, a Chicago-based social media marketing agency. “Contests on Pinterest can range anywhere from adding a comment on a photo, to ‘repinning’ a photo on a user’s own board, to submitting a photo,” she says. As with all social media, Pinterest works best when brands are active and engaged with their followers. Although Pinterest’s future is uncertain, its visual format seems to be more permanent. Quick Serves Pin Social Media Hopes On Pinterest – Restaurant News – QSR magazine. How Social Are the World’s Most Valuable Brands? This report ranks brands according to popularity, receptiveness, interaction, network reach, and trust on social media sites. The sites were tracked on Facebook, Twitter, YouTube, and the Web in general. Technology and media companies had the home court advantage when it came to popularity and reach, with Google, Apple, and Disney taking the top three spots. But other brands were more successful in different areas, like listening and responding to feedback from customers. Fast-moving consumer goods (FMCG) like Johnson and Johnson seemed to do this especially well. The chart also compares the top companies’ valuations (in U.S. dollars) to their social media performance scores. Analysts saw a positive correlation between the two, although it looks uneven on the chart. The most valuable company on the list also had the highest social media performance score. A whopping 97.09% of respondents said that an online experience has influenced whether or not they bought a product or service from a brand. The number 1 reason for following a brand is access to special offers and deals (36.9% of Facebook/Myspace users, 43.5% of Twitter users). The runners up for top reasons people follow brands are that they are current customers or that they are following because of interesting and entertaining content. Most admit that when they are following a brand they are more likely to consider the brand when in the market for the product, buy the product from the brand and recommend the brand to others. On average, people follow between 2 and 5 brands on Facebook. How many are you following? Check out the full infographic below. Why do you follow brands on Facebook and Twitter? Consumers Prefer Brand Updates Via Facebook Over Email & Traditional Ads [Infographic] – SocialTimes.com. The technology that makes up many of the systems in the IT world today is at a critical juncture and in the next five years everything from mobile devices and applications to servers and social networking will impact IT in ways companies need to prepare for now, Gartner Vice President David Cearley says. 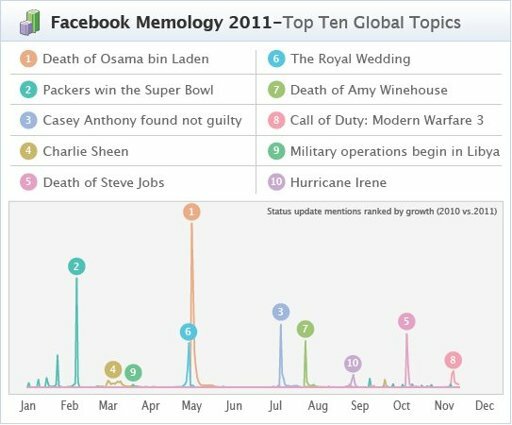 30 billion pieces of content were added to Facebook this past month. Worldwide IP traffic will quadruple by 2015. More than 2 billion videos were watched on YouTube … yesterday. The average teenager sends 4,762 text messages per month. 32 billion searches were performed last month … on Twitter. 1. Media tablets and beyond: Bring-your-own-technology at work has become the norm, not the exception. With that come security and management challenges that IT needs to address. By 2015 media tablet shipments will reach around 50% of laptop shipments and Windows 8 will likely be in third place behind Android and Apple. 2. Mobile-centric applications and interfaces: Here touch, gesture and voice search is going to change the way mobile apps work in the future, Cearley says. By 2014, there will be more than 70 billion mobile application downloads from app stores every year. 10. Cloud computing: This topic went from No. 1 last year to No. 10 this year, but it’s still an important trend. It will become the next-generation battleground for the likes of Google and Amazon. Going forward, enterprise IT will be concerned with developing hybrid private/public cloud apps, improving security and governance, Cearley says.